Delegates from around the world fly yearly to Brazil to celebrate the Special Thanksgiving Celebration and to personally greet Bro. Eli Soriano on his Sabbath anniversary. Thousands will once again flock to the ADD Convention Center in Apalit, Pampanga, to celebrate the Members Church of God International’s (MCGI) first quarter International Thanksgiving to God from April 5 to 7 this year. Coinciding with the three-day festivities is the welcoming of the Christian New Year on April 5 and the commemoration of Bro. Eli Soriano’s 55 years of service to God on April 7. 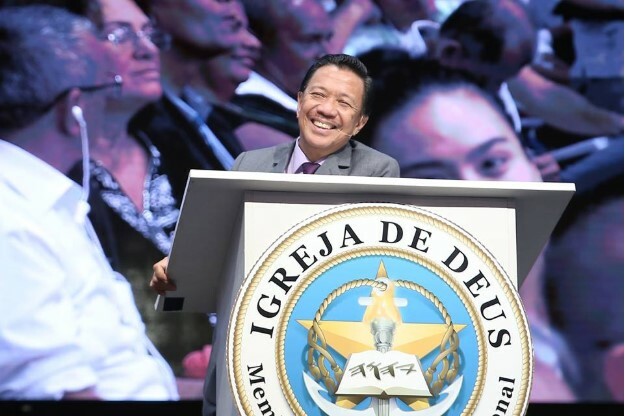 While the ADD Convention Center in Apalit, Pampanga serves as the main venue for the majority of congregants, Brazil will be hosting the first quarter international event for the fifth time. Delegates from all over the world have started flying to Brazil to experience the Special Thanksgiving event in Latin America, meet congregants from various countries and nationalities, and offer the sacrifice of thanksgiving together. The yearly pilgrimage to Brazil is a chance for the Church’s members to meet Bro. Eli Soriano who is currently preaching throughout the South American continent. The preacher will be celebrating his 55th Sabbath anniversary on the third day of the International Thanksgiving. The event will be streamed in all MCGI locales, and real-time translations will be available for members across the globe. Members of the Music Ministry and Teatro Kristiano present a festive opening during Thanksgiving celebrations. 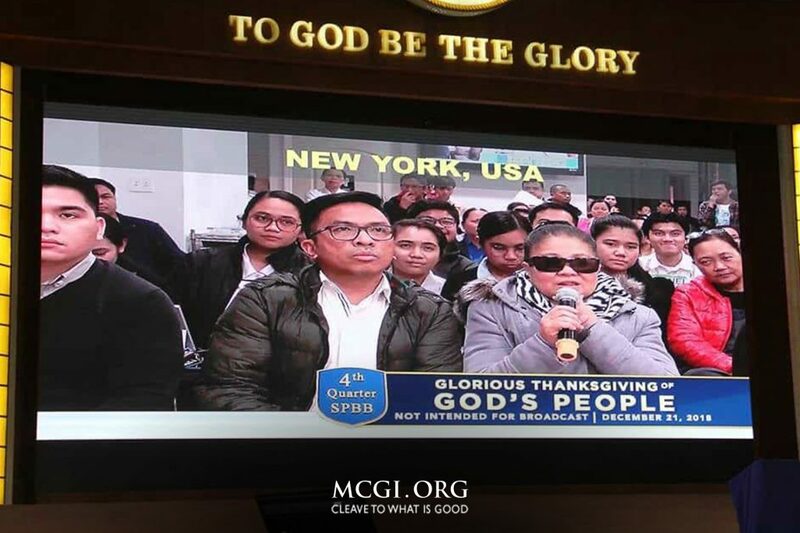 The presentation pictured above was taken during the 4th quarter Special Thanksgiving of God’s People in December 2018. The program during Special International Thanksgiving includes the discussion of biblical topics delivered to the congregation by Overall Servant Bro. Eli Soriano and Assistant Overall Servant Bro. Daniel Razon. In some instances, Bro. Eli opens a forum for brethren who would like to ask questions about the topics discussed during the Special Thanksgiving. The congregation also await for the coming of the Biblical (Christian) New Year (Year 5779) that coincides with the first day of the International Thanksgiving celebration on April 5. This celebration is based on the Hebrew Calendar that the early Christians used. During the event, a topic about the Christian New Year is discussed. 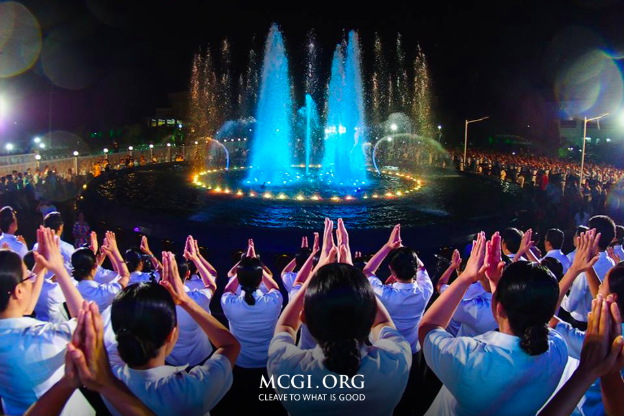 Instead of fireworks, songs of praise and prayers will close the outgoing year and the incoming year for MCGI. 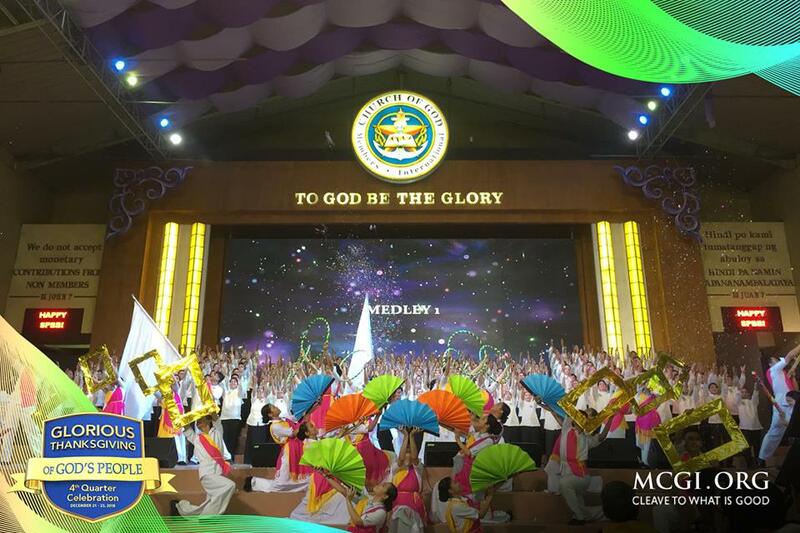 MCGI started celebrating the Christian New Year in 2004. On April 7, Bro. Eli Soriano will celebrate his 55th Sabbath Anniversary, simultaneous with the third day of the International Thanksgiving. As his practice, Bro. Eli and his household in Brazil will be offering songs of praise and thanksgiving. His reasons include the growing work of the propagation in Brazil that continues to reap souls, reaching to other Latin American countries. Bro. Eli Soriano will be celebrating his 55th year of service to God this April. Currently in South America, Bro. Eli continues to preach the Gospel to Latin American audiences through Bible Expositions, television programs, Bible studies, and mass indoctrinations. Since he started preaching the Gospel in Brazil several years ago, Bro. Eli had already established programs in many TV stations and held countless Bible Expositions. He also brought to Latin America the charity works he started in the Philippines, offering services like visiting homes for the elderly, free feeding programs for the poor, and blood donation drives. These charity efforts were supported by the brethren in Brazil who usually served as volunteers. Social welfare workers and non-government organizations in Latin America who have witnessed the missions have lauded the charitable missions. The Members Church of God International (MCGI) will hold a one-day International Caucus on March 30. While Church pioneers will share the various chapters of the history of MCGI, Bro. Eli Soriano will address the concerns of members with biblical advice. Instead of a regular topic discussion after the offering of thanksgiving songs, the program will shift to accommodating questions from members around the world. Members who need guidance in dealing with problems will hear answers straight from the Bible through Bro. Eli Soriano and Bro. Daniel Razon, the Overall Servant and Assistant to the Overall Servant, respectively. Translations will be available in several languages. The International Caucus will serve as a form of spiritual preparation for the members of the Church. Bro. Eli and Bro. Daniel expressed that the caucus is one way to help members get ready for the three-day International Thanksgiving on April 5 to 7. The Overall Servants hope that each member will be spiritually prepared and relieved of their problems before offering the sacrifice of thanksgiving to God. The consultation is an opportunity for members of the Church to ask Bro. Eli matters that are personal to them. It also serves as a means to clarify things about topics shared during gatherings, such as Thanksgiving. The format of the consultation portion of the International Caucus is similar to Ang Dating Daan’s (ADD) program segment Itanong Mo Kay Soriano, Biblia Ang Sasagot (Ask Soriano, The Bible Will Answer). But unlike the Ang Dating Daan program segment which is a biblical consultation for religious freelancers, truth seekers, and people of varied faiths, the International Caucus focuses purely on the concerns of MCGI members. 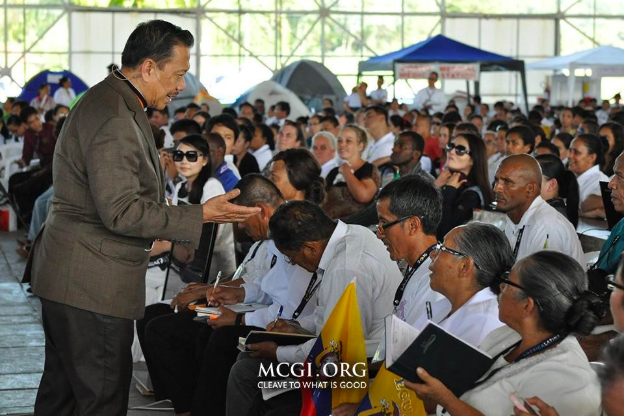 The consultation in MCGI had its beginnings in the mid-90s, although it was not held as frequently as the current practice. The present setup includes the consultation as part of the regular International Thanksgiving and is allotted with two hours at most. The International Caucus will begin in the morning and end in the evening of the same day, a first for MCGI. Moses in his time sat to judge the children of Israel who went to him for counsel. In Exodus 18:13-26, it can be read that Moses heard the people’s causes from morning until the evening. Upon his father-in-law’s advice, Jethro, Moses chose able men out of Israel to rule over thousands, hundreds, fifties, and tens to judge over small matters. The hard causes they brought forth to Moses to judge. In the New Testament, specifically during the earthly ministry of the Lord Jesus Christ, people asked him on matters of the law. Multitudes of people came unto him to hear his teachings and inquire on the law, even if some were only testing him, especially the Pharisees and the Sadducees. The surviving pioneers of MCGI share their fondest memories and experiences during the early propagation efforts of the Church. During the International Caucus, they will be giving details of their chronicles of faith. Aside from the consultation with Bro. Eli and his answers from the Bible, a portion of the International Caucus will feature MCGI’s pioneers who will share their experiences during the early years of the Church’s existence. This activity will be for the benefit of the new members in the Church who are yet to learn the extensive history of MCGI from the viewpoint of the first fruits of the evangelization efforts. Once again, the Members Church of God International is set to give thanks to God as an entire congregation come October 5-7, 2018 for everything that has happened these past three months since its last quarterly International Thanksgiving to God in July. One of which is the National Trades Union Congress (NTUC) of Singapore’s conferment of its Gold Award to MCGI. It is the second time that the Church has received the said recognition in light of its efforts in improving the wellbeing of the Southeast Asian country’s senior citizens. (From right) MCGI Helpers of the Ministry Bro. Efren Baquing and Bro. 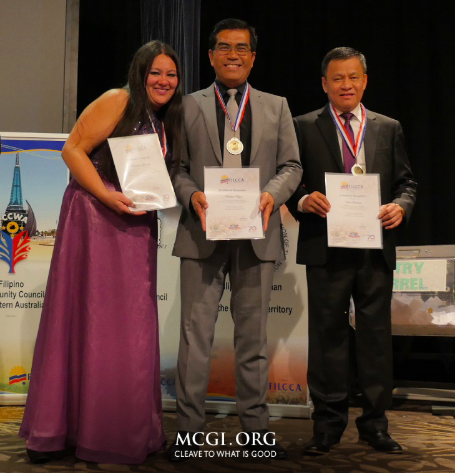 Resty Reyes receive the certificates of recognition from The Filipino Community Council of Australia (FILCCA) in 2016 for the Church’s humanitarian efforts in the continent. Attending to the needs of the elderly is one of MCGI’s charitable thrusts. Thus yearly, it consistently renders services like gift-giving and visiting and entertaining elderly communities from Australia to Peru. The last two months of the present year also saw milestones in the Church’s efforts in broadcasting God’s words and singing praises to Him. On September 3, the Truth Channel on Digital TV celebrated its first anniversary on air. The channel broadcasts via satellite and requires no subscriptions or fees, and is carried by digital TV service providers. “The Truth Channel produces and features shows and segments about the Bible, faith, belief and religion,” and also broadcasts its diverse programs 24/7 on its live streaming site. 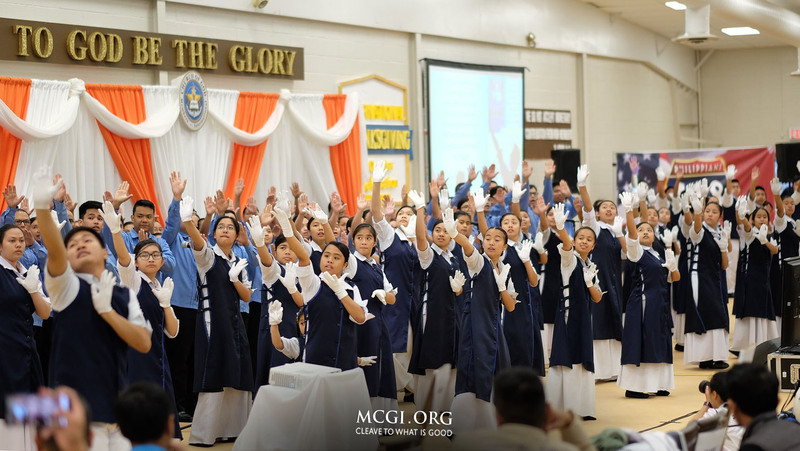 Earlier in August, MCGI choristers revelled in Thanksgiving as they celebrated 10 years of the Church’s nonstop singing of praises initiative. It began on August 10, 2008 after a Thanksgiving topic that touched singing praises to God. What ensued was an activity that took cue from what the first nation of God did in 1 Chronicles 9:33, where Israelite choir members sang unto the Lord day and night. On August 4, the Artist Guild National General Assembly was held with the aim of gathering all the artists in the Church gifted with talents in the visual arts. More importantly, it was to discuss how they could use their time and skills together in bettering their duties. In the same month, MCGI donated a much-needed cafeteria for the students of the public elementary school of Calumpang, Bulacan, a province north of Manila. Brgy. Chairman Arnel Faustino (left) shakes the hand of MCGI Helper of the Ministry Bro. Danny Navales as he represents the village in accepting MCGI’ and UNTV’s donated ambulance and public school canteen. 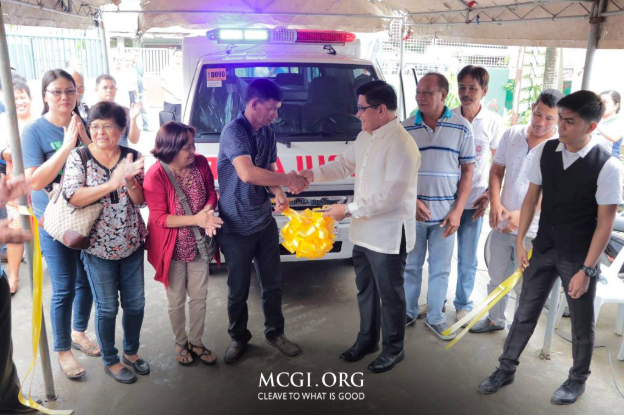 The barangay or village also received an ambulance from the group who worked together with public service channel UNTV to help bring the two projects into fruition. 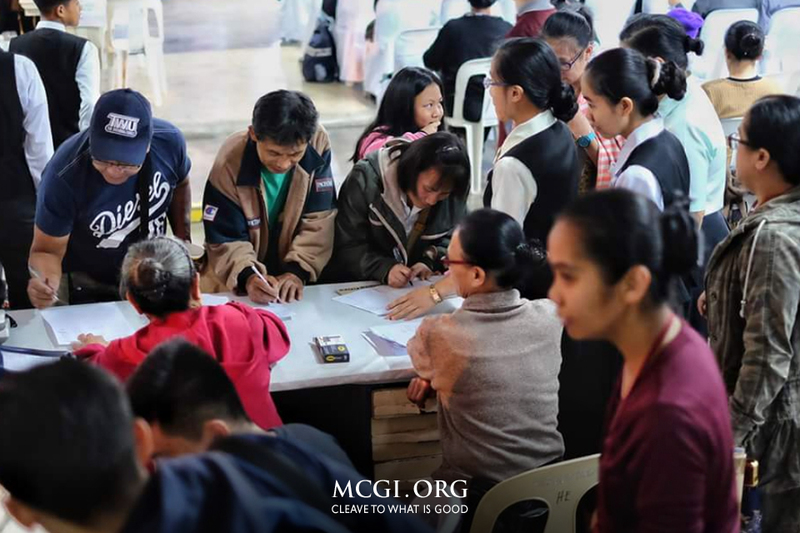 For the ability to continue its regular humanitarian works and more, MCGI recognizes that it could never be without the help and mercy of the Lord. Which is why having the opportunity to do good is one of the common reasons resounding during the Church’s weekly Thanksgivings. But then, there come special reasons to all the more thank God for. After many years, MCGI Overall Servant Bro. Eli Soriano and Assistant to the Overall Servant Bro. Daniel Razon held live Mass Indoctrination sessions which started on July 16, 2018 at 7 pm nightly, Philippine Standard Time. The three-week event resulted to more than 3,000 souls being baptized on the same day, August 3rd. It prompted a one-day Special International Thanksgiving on August 12th, two days after the next set of live Mass Indoctrination sessions were opened. Bro. Eli remarked during the said Thanksgiving service that the outcome was reminiscent of the first-century Christians’ achievement written in Acts 2:41. It was the day of the Pentecost when the Apostles were given gifts so they could speak in languages other than their own. Since a multitude of people coming from different nations were gathered in one place at the time, more were able to understand the Gospel, believe, and be baptized. Before 2018 ends, there will be two more Thanksgiving of the Whole Nation events with the nearest one on November 30 to December 2, coinciding with Bro. Daniel’s 35th year of service to God. Bro. Daniel recently visited the brethren in North America. The North America Convention was held in Los Angeles from September 8-9 with Bro. Daniel leading the activities, much to the delight and edification of faith of the members in the region. The students and teachers from Calumpang Elementary School in Calumpit, as well as the residents of Barangay Calumpang, province of Bulacan, thanked the Members Church of God International (MCGI) and public service channel UNTV News and Rescue, for the donations doled out by partners in public service. 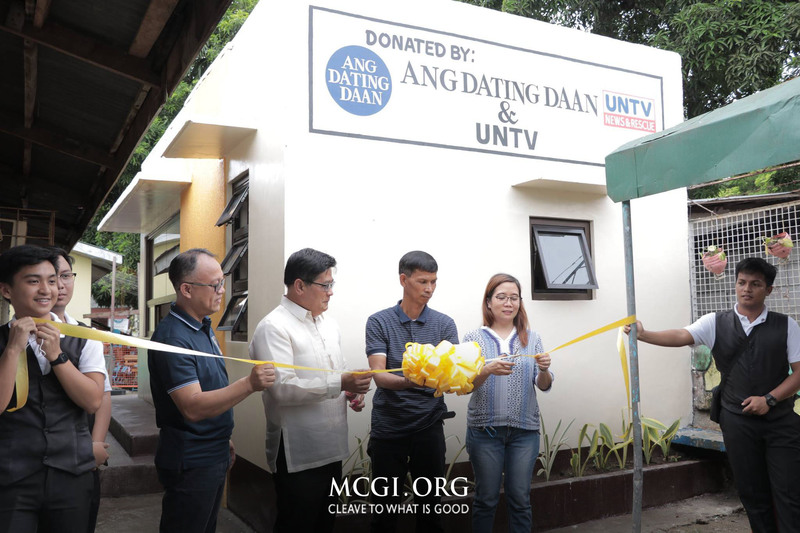 The Members Church of God International (MCGI), together with UNTV, donated a new school canteen to the Calumpang Elementary School, which the school’s principal quipped as a “great thing”. 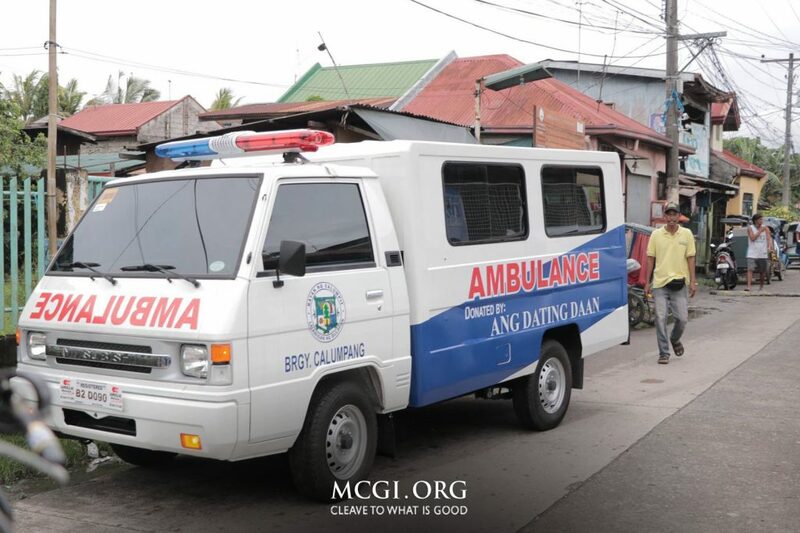 Moreover, MCGI and UNTV donated a new ambulance to Barangay Calumpang, which for 20 years has been using a second-hand multicab to transport sick residents to a nearby hospital. “This is a rare event in our barangay. Think of it, a brand-new ambulance patrol was given to us! I had not thought of this so I am thankful to Kuya Daniel and Brother Eli. The Sanggunian thanks you,” Brgy. Chairman Arnel Faustino said in thanking the group for their public service. Brgy. Chairman Faustino explained that their old multicab has already shown signs of retiring, which means maintenance has become more costly. In details, the ambulance contains a new medical kit, stretcher, backboard, oxygen tanks and BP apparatus. Along the turnover ceremony, 448 individuals benefited when the group also took the opportunity to conduct a medical and dental mission activity in the area. Worldwide streaming. From South America, Brother Eli Soriano preached the core doctrines of MCGI during the Live Mass Indoctrination. Thousands attended the event held in all the Church’s locales. Pampanga, Philippines – More than 3,200 were baptized in Members Church of God International (MCGI) on August 3, 2018. This was after the two-week Live Mass Indoctrination began on July 16 this year. 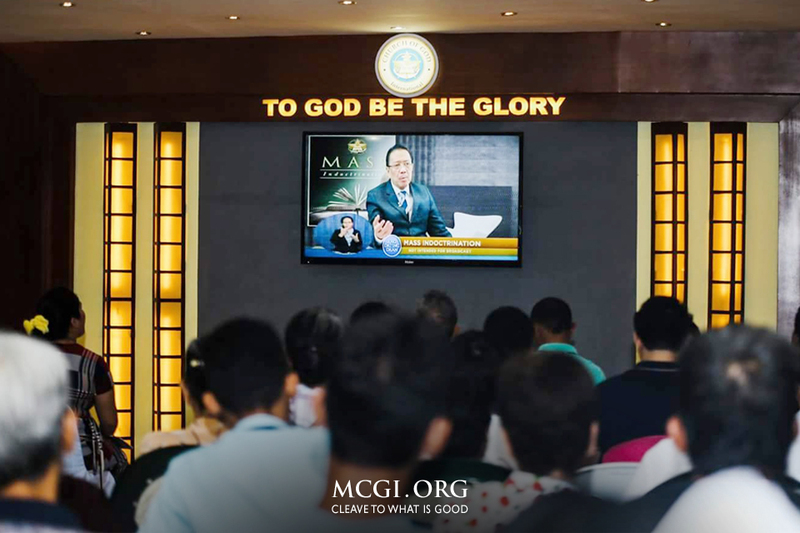 The Live Mass Indoctrination was streamed in all MCGI locales worldwide. Bro. Eli Soriano and Bro. Daniel Razon, the Overall Servant and Assistant to the Overall Servant, respectively, led all the sessions. Bro. Eli also answered questions about the basic teachings in MCGI. It was patterned after Itanong Mo Kay Soriano (Ask Soriano). The baptism of more than 3,200 is not the first time for MCGI. Since 2001, the number of those baptized peaked to thousands. One thousand new members in a single day is still modest. In recent years, more non-Filipinos were getting baptized into the Church. The coming of the Gospel to the West opened doors for Latinos to study the Bible. Bro. Eli spent much for TV airtime and Bible Expositions there. 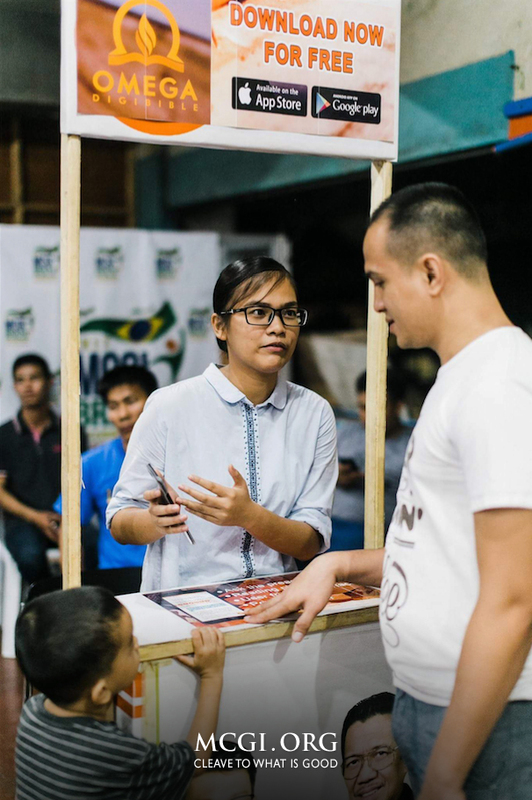 These efforts, coupled with charities, invited truth seekers to learn MCGI’s doctrines. Preaching in the West was fruitful. There are now 155 locales in Brazil and 267 in Spanish-speaking countries. This number is expected to grow in the coming years, God willing. The 24/7 broadcast contributed to the increase of members. The Church’s charities also raised people’s awareness about MCGI. All these are with God’s help and mercy. Church members also attended the indoctrination. They joined the event to refresh on the doctrines. One of them is Brother Ariel Juaniza, 53, of Pag-asa, Cavite. He has just entered his second year in MCGI. Brother Ariel is blind and has end-stage renal disease (ESRD). His illness needs either a kidney transplant or dialysis. Currently, Brother Ariel is under individual Church service. Church workers visit and attend to his needs. They also update him on topics during gatherings. His condition did not stop him from attending. He wanted to respond to Bro. Eli’s call to join. Brother Ariel’s faith inspired the brethren in Pag-asa. They supported his desire to be part of the event. They fetched him daily to the indoctrination. The new members offered Thanksgiving at the ADD Convention Center on August 5. Among them is Brother Efren Montebirhen, 56, a former deacon of 15 years. Brother Efren’s interest in Bro. Eli started when he was still active in his former church. He began to doubt the leaders who banned members to listen to multi-awarded international televangelist. He never knew why. His leaders never told the reason. The lack of care from his church weakened his faith and drove him to do vices. No one, he said, helped nor uplifted him. Worse, he was expelled. This left him depressed and sick. From then on, Brother Efren attended Bible Expositions. He also watched Bro. Eli on TV until the late hours of the night. New Bible app for your phone. The Omega DigiBible, latest offering of VsionTeq, was used extensively during the two-week live mass indoctrination. Kiosks were put up in MCGI locales worldwide to assist guests in downloading and using the application. The Omega DigiBible was used during the indoctrination. Bro. Eli himself suggested those with smartphones to install the app. Free WiFi kiosks were set up in MCGI locales for visitors to try it. The Omega DigiBible was developed by VsionTeq, an Android and iOS developer in Singapore. It was launched in April and is available on Google Play and the Apple App Store. The Omega DigiBible comes with many features and is accessible offline. The Omega DigiBible is a top downloaded app on Google Play. It reached number 1 on July 20 while the indoctrination was ongoing. The Mass Indoctrination is required before baptism. Its aim is to teach future members on faith and discipline in the Church. A person baptized assumes the duties of a member. Another session of live indoctrination began on August 13. God willing, in two weeks’ time, another batch of thousands will be baptized. For questions about indoctrination, email addcentral@gmail.com or message +63.943.254.5390. “Our good works accomplished on a day-to-day basis are considered a form of worship and service to God. Every good work we do is recorded.” Colossians 3:24 to 25 was read as the biblical reference of the message. This was the message that resonated as Bro. 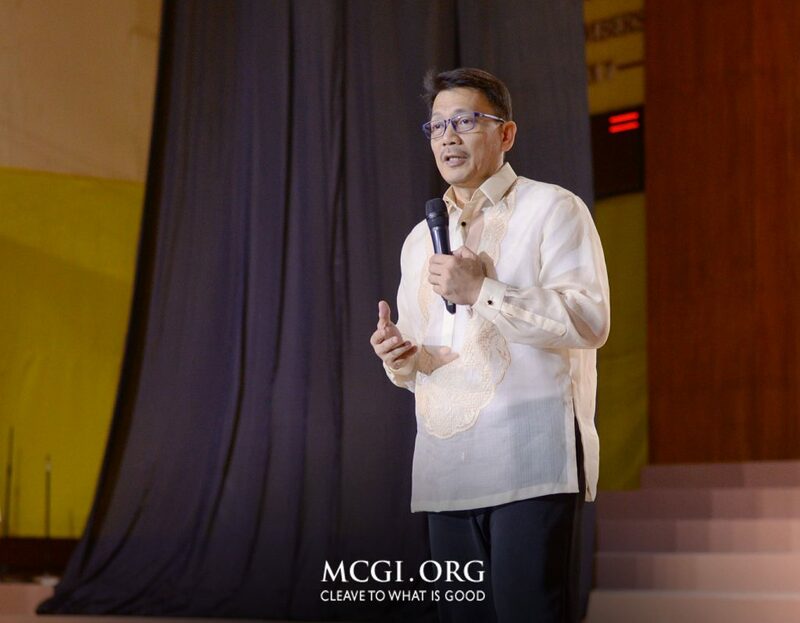 Eli Soriano, Overall Servant to Members Church of God International (MCGI), wrapped up the Special Thanksgiving of God’s People for the 2nd quarter of 2018. For this quarter, once again, the congregants’ gratitude to the Almighty God and the Lord Jesus Christ concluded with never-before heard wisdom, and delightful thanksgiving presentations from all over the world. A Special Thanksgiving of God’s People, held for three days, is called in the vernacular as Special Pasalamat ng Buong Bayan ng Dios. 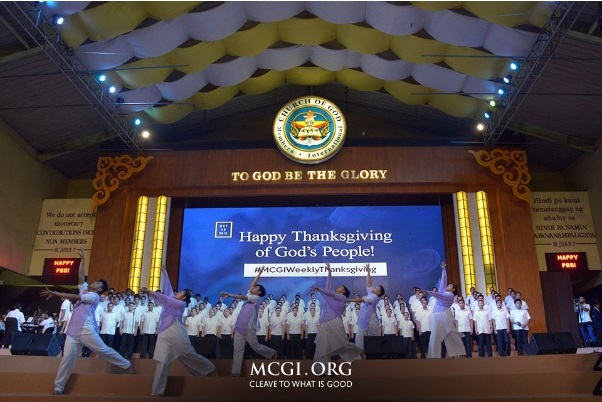 Filled with singing, dancing, and encouraging messages, the mirthful affair once again created memorable moments for each and every member of MCGI, as in every Special Thanksgiving celebration. 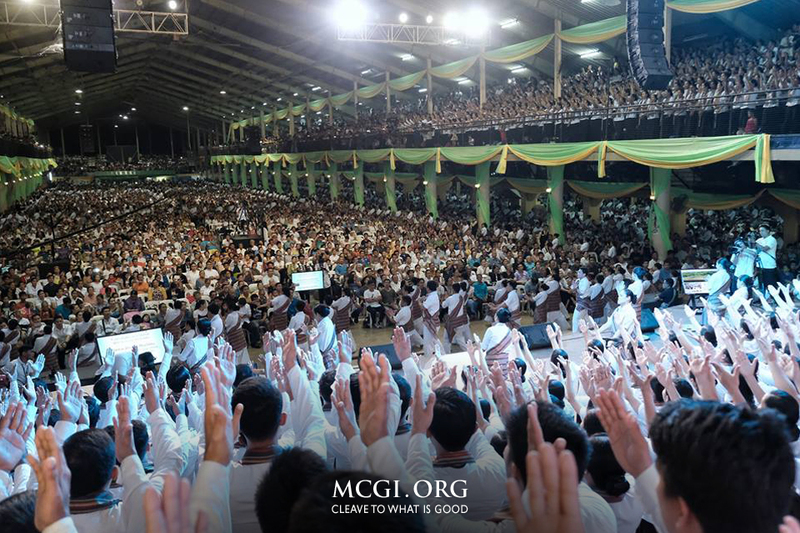 Tens of thousands of brethren from different regions of Luzon, Visayas and Mindanao in the Philippines convened for three consecutive days at the ADD Convention Center in Apalit, Pampanga and in all MCGI coordinating centers nationwide. Across the world, brethren from Asia-Oceania, Africa, the Middle East, Europe, North America, South America, and Latin America, were unfazed by distances and differences in time zones just to attend the event.. Through faith, physical and spiritual obstacles were overcome just to be able to partake in the glorious event. Traveling stretches of miles and hours, hauling luggages, sometimes with kids and elderlies in tow, were not enough to hinder the spirit of a member longing to partake in the much-awaited celebration. This was evident in live video streams showing packed and crowded thanksgiving sites in various locations. As the gathering commences, festive song and dance presentations that express how grateful brethren are, were showcased. This was led by the Music Ministry composed of the MCGI chorale and orchestra, and the Teatro Kristiano. 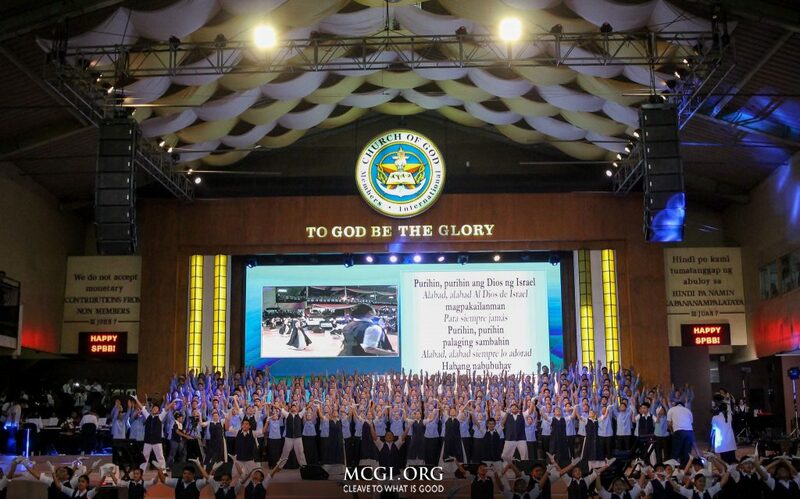 These groups, for many years now, have been serving MCGI brethren with their musical and theatrical talents. Sister Grace Checa of the Music Ministry, a sister in faith since 1998 and a Music Ministry core member for 17 years, shared with MCGI.org why she always makes it a point to sing on stage with the rest of the chorale members every thanksgiving celebration. Indeed it is a joy for brethren to use their talents and skills to offer as sacrifices of thanks to God. One group that also made sure to put to good use their vocal talents is the National Capital Region (NCR) chorale who presented their winning Gospel Show entry “Layag, Kabataan” (Sail, Youth) to MCGI with powerful vocals, impressive choreography and colorful costumes. Group presentations were also one of the highlights of the event. Special videos and documentaries from the Children’s Ministry, the Youth Ministry, Prison Ministry, Worker’s Ministry, Luzon, Visayas and Mindanao regions, Foreign Ministry, Mission Thessalonica, South America and Latin America were shown, recapping activities and events, highlighting charitable projects, evangelical missions and other programs that aim to strengthen members’ faith and spirituality, as written in Philippians 4:8. A special song presentation of Bro. 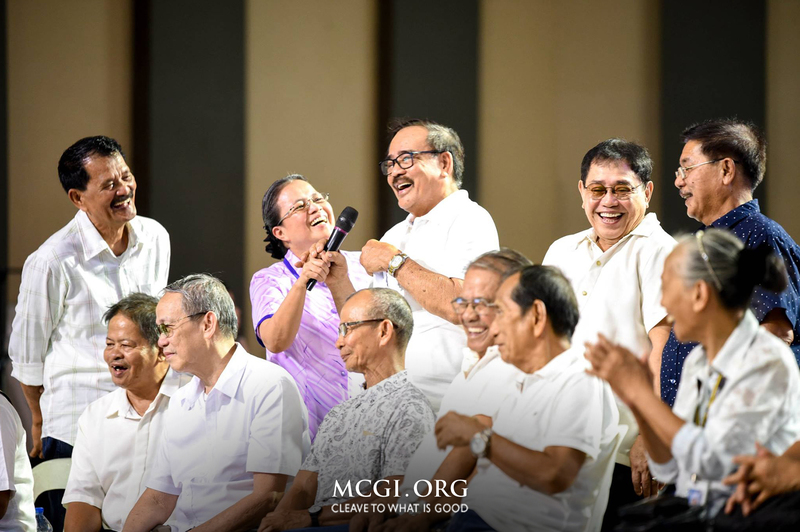 Eli’s household delighted members as they performed lively song adaptations to convey their heartfelt thanksgiving to God, with a cute video of their group of Kawan ng Cordero (KNC). Bro. Eli and Bro. Daniel, both solid advocates of truths in the Bible, put more effort than anyone else in the religious world to study the Holy Scriptures. This quarter, new wisdom were shared to MCGI through the thorough study of God’s words with the help of Hebrew translations. According to Bro. Eli, not all translations of the words in the Holy Scriptures are correct. Therefore, “As Christians, we must know how to distinguish what’s right and wrong,” Bro. Eli shared. Bro. Eli and Bro. Daniel discussed more accurate and apt translations, not only based on context but also by referencing other verses in the Bible. They made comparisons and analysis to make sure the topic they delivered were clearly understood by brethren. Intriguing, new truths were revealed as delivered by Bro. Eli and Bro. Daniel according to God’s will, including Job’s words in Job 2:10, the mystery of the Great Babylon that many religions claim to be the Catholic church, and about the book of remembrance and the book of life where God records benevolent acts and a Christian’s obedience. For this heavenly gift, MCGI once again offers another Special Thanksgiving to God a week after the three-day celebration (July 15). 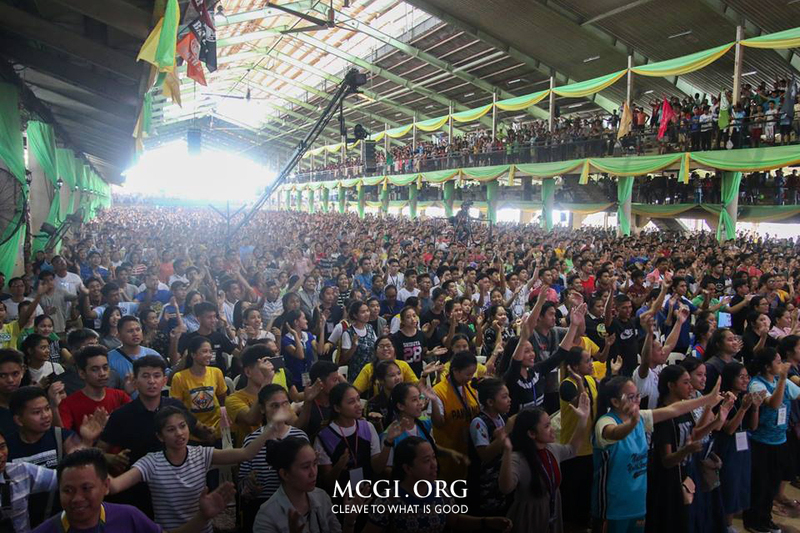 MCGI brethren offered the sacrifice of thanksgiving for plenty of reasons. From simple wishes granted, adequate daily provisions, God’s safekeeping and protection, to recovery from illnesses, opportunities to show benevolence to others, incredible wisdom learned in the Holy Scriptures, God’s forgiveness are just a few of the many reasons to thank the Highest. These brethren graciously shared their reasons for thanksgiving featured on official social media pages of MCGI.org. Finding the one true religion and God’s messenger in this dispensation amidst the estimated 4,200 religions in the world and thousands of false preachers are indeed a unique blessing one can receive from the heavens. Understanding God’s deep wisdom that will remain a mystery to non-believers is another reason for brothers and sisters to offer the sacrifice of thanksgiving. Fervent supplications are also made during the celebration of thanksgiving. In Bro. Haminton Bustillo’s case, he prays for his family to join him in the Church someday. Material blessings and receiving God’s kindness everyday are reasons to be grateful to God but it is also equally important for MCGI brethren to be good followers of Christ through God’s spiritual wisdom. 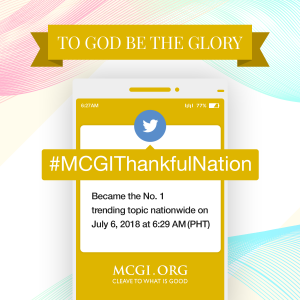 For three consecutive days, official social media accounts of MCGI featured hundreds of thankful tweets from members, in and outside of the Philippines. Through members’ continuous and untiring support to filling the internet world with positive vibes, the official daily trending hashtags from Days 1 to 3 landed the number one spot between 6:29 AM to 6:39 AM PHT in the Philippines. Trending tweets including unique reasons for thanksgiving, favorite SPBB memories and songs, plus photos of joyful brethren from around the world circulated on Twitter and Facebook from July 6 to 8. Putting social media to good use for the benefit of many is one of Bro. Eli and Bro. Daniel’s reminders, thus producing “thankful” tweets that are both inspiring and heartwarming from brethren. For the deep wisdom learned and for understanding how God records good works, MCGI dedicate another one-day Special Thanksgiving of God’s People celebration on July 15, 2018. 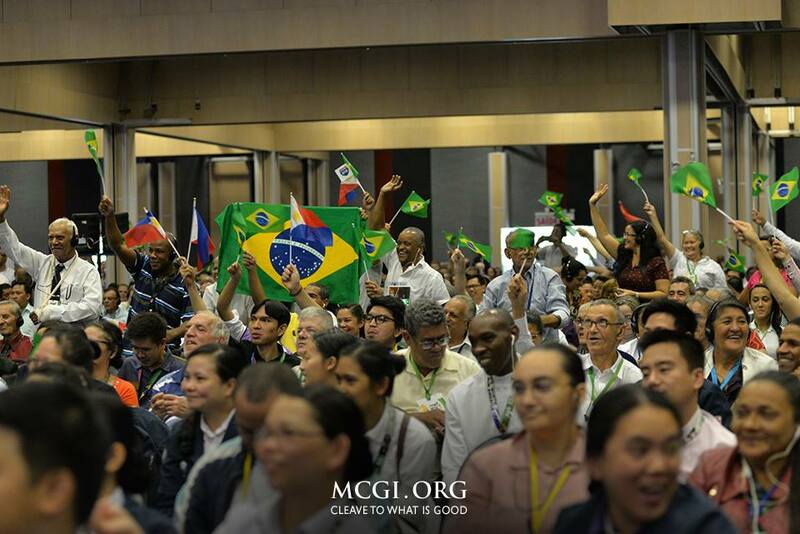 Three months after this year’s first quarter Special Thanksgiving of God’s People held in Brazil, the Members Church of God International (MCGI) is all set for the second quarter Thanksgiving celebration on July 6-8, 2018. 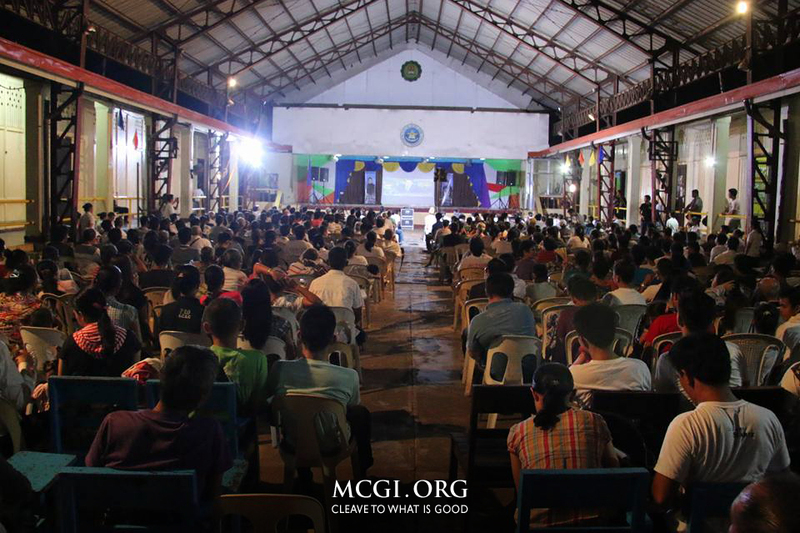 During its quarterly Special Thanksgiving celebration, MCGI congregants offer praises and listen to new special topics for three straight days. The Church of God holds its regular thanksgiving service on a weekly basis. New biblical topics are opened each day for three days by Bro. Eli Soriano and Bro. Daniel Razon, MCGI’s Overall Servant and Assistant to the Overall Servant, respectively. Special Thanksgiving is one event that Church members always look forward to every quarter. 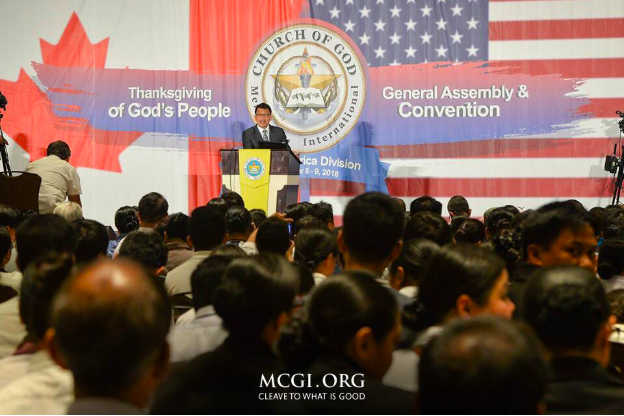 Many members travel far to attend the event at the ADD Convention Center in Apalit, MCGI’s headquarters in the Philippines, and other main venues in different divisions. “I look forward to seeing the brethren. There is that feeling that even if I don’t know some brethren yet personally, just thinking about being with them [in Thanksgiving] makes me excited,” exclaimed Sis. Abi Valdez of San Francisco, USA. Sis Abi is traveling north to Canada to attend the upcoming gathering. While preparing themselves clean and acceptable to God is foremost, members also gear up their locales for the big event. The Artist Guild – the creative artwork and design committee in a locale – arranges beautiful designs for their venues, usually with eye-catching colors and decorations fitting for the jovial theme. “The decoration of the locale is always a challenge because it needs a lot of inspiration. I consider this event very precious for the brotherhood,” Sis. Karol Klein, a Brazil local, shared her experience with decorating for the Special Thanksgiving. Other committees and groups in the Church such as the Music Ministry and Teatro Kristiano are also preparing for their production number. MCGI thanks God primarily for the many opportunities to be an instrument in His works of salvation. 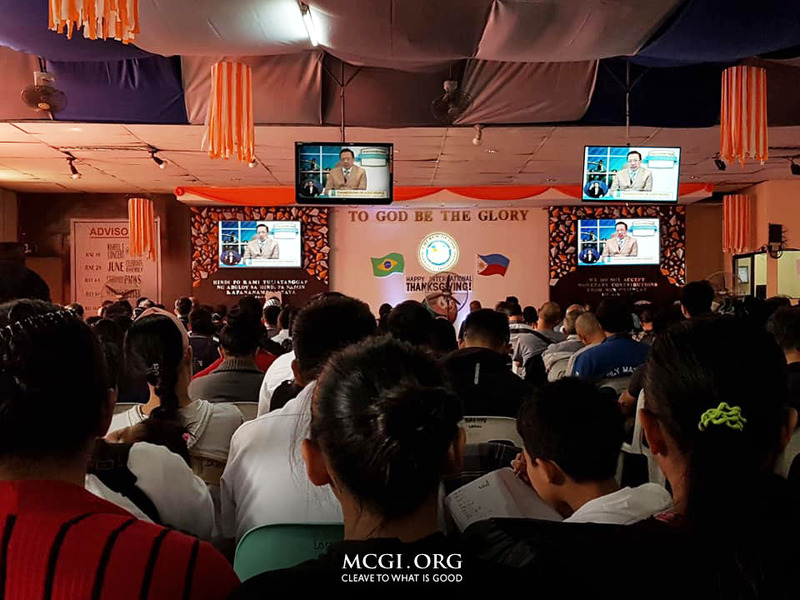 From April to June 2018, the live Bible Expositions, Bible studies and Mass Indoctrinations hosted in MCGI locales around the world reaped thousands of new members. The past three months have also been fruitful with different projects, community outreaches, and Church activities launched and carried out to strengthen the members’ faith as well as to help non-members of the Church. 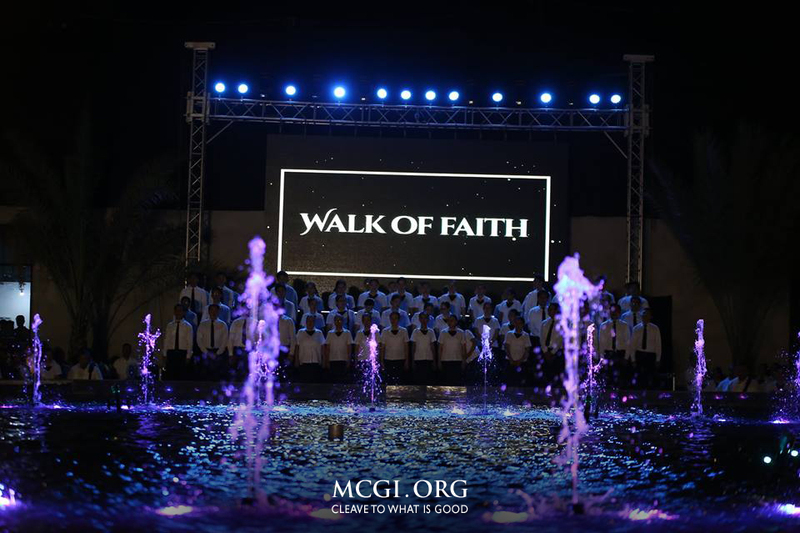 Inaugurated last April 30, 2018, MCGI’s The Walk of Faith at the ADD Convention Center in Apalit, Pampanga takes strollers to inspiring walks of faith of the early faithfuls named in the Bible. Along with stone tablets that engrave the names and faithful acts of those called “heroes of faith” is a fountain that dances to songs of praises. 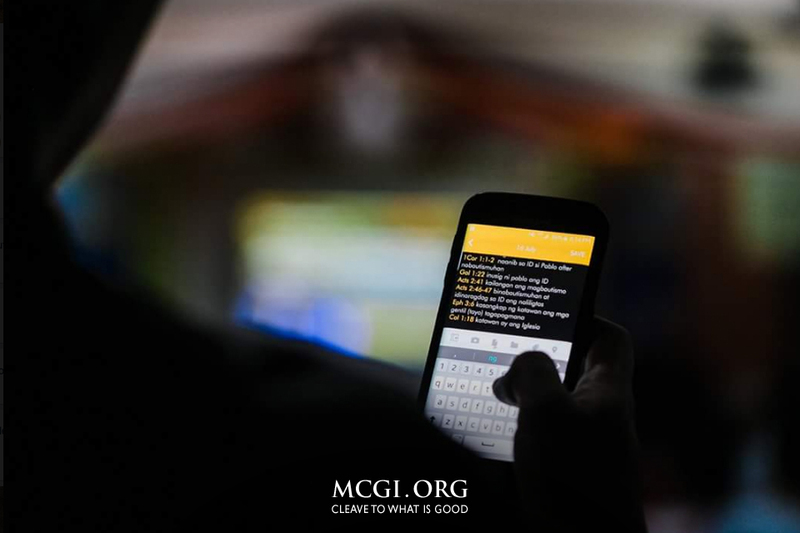 Also in April, MCGI launched the Omega DigiBible in the Apple App and Google Play Stores, giving everyone a handy access to the Word of God. The Bible app brings unique user experience with its top features including Parallel Reading, Top of the Hour Prayer, A Preacher’s Blog and Bible Reading Plans. It currently has at least 27 Bible versions including two audio ones. The sports edition of the annual International Youth Convention held last April 30 to May 1 gave the youth of the Church opportunities to bond through various sports and activities, as well as listen to advice from Bro. Eli and Bro. Daniel through the youth consultation. Recently, the Teatro Kristiano concluded their 9th Dance Play Festival where members of the theatrical group from different divisions showcased their acting and dancing talents. The Music Ministry also organized a Gospel Show Choir. Around the globe, brethren have organized their local events such as “Mother’s Club” in Europe, “Father’s Club” in North America, “Couple’s Night” in Singapore, and KNC competitions and activities. MCGI also conducted continuous medical missions with key media partner, UNTV News and Rescue, visiting provinces and jails to reach out those in need of medical help. 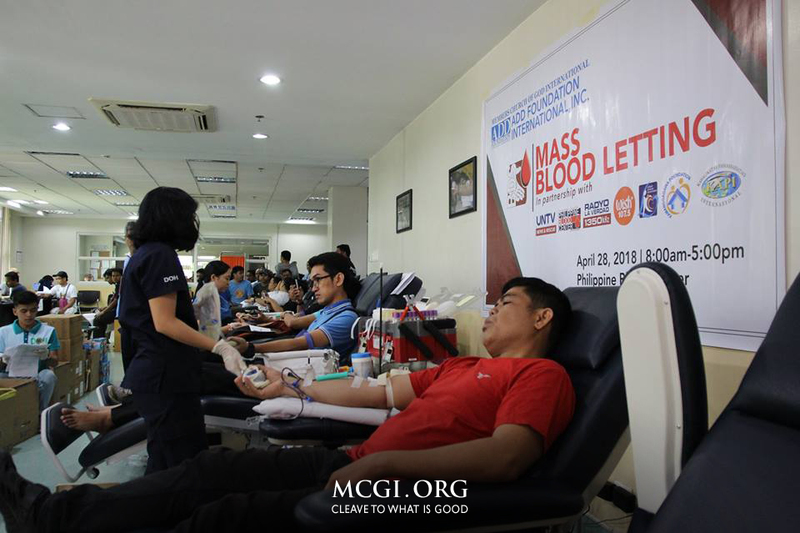 The Church’s blood donation drives in the Philippines and abroad have produced thousands of blood bags, benefitting Filipinos and non-Filipinos. Thousands who attended and watched the ninth edition of the Dance Play Festival witnessed the showcase of theatrical prowess by different participating divisions on June 10, 2018 at the ADD Convention Center in Apalit, Pampanga. Assistant to the Overall Servant Bro. Daniel Razon graced the event and gave the opening remarks on the value of fostering love of serving and performing one’s duty in the Church. “According to the measure of our faith, we have our different roles to fulfill in the Church (referring to Romans 12:3)”, said Kuya Daniel, then expounding on the importance of having the satisfaction from hearing and obeying God. Bicol Division Teatro Kristiano participants pose for a picture as they celebrate their victory as Best Danceplay 2018. Bicol Region bagged multiple awards for their dance-play “Anino” or “Shadow”, an orchestration of silhouettes of the characters/actors, objects and cut-out sets that created cinematic feels both on the wide LED screen of the Convention Center and onstage. Supported by captivating music and dexterity, the enthralling shadow play created a new kind of dramatic space while at the same time explored new theatrical disciplines. The combination of all these forms resulted in an inventive and innovative dance-play, leaving a lasting impression on the judges and the audience. “Anino” also earned for Bicol Region the Best Director Award for Bro. Nino Medrano, Best in Music, and Best Male Lead Performer for Bro. Raymund John Samson. 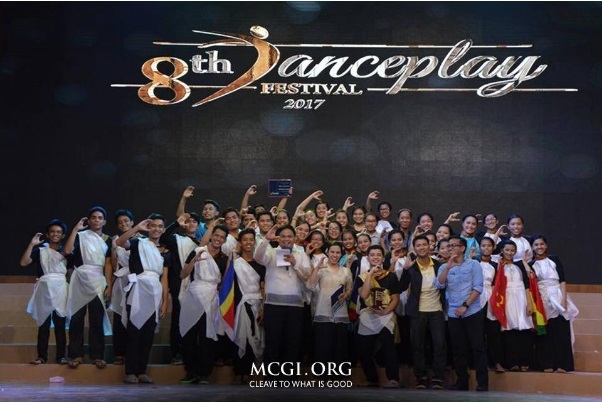 Last year, Cavite Region won the Best Dance-play of 2017. 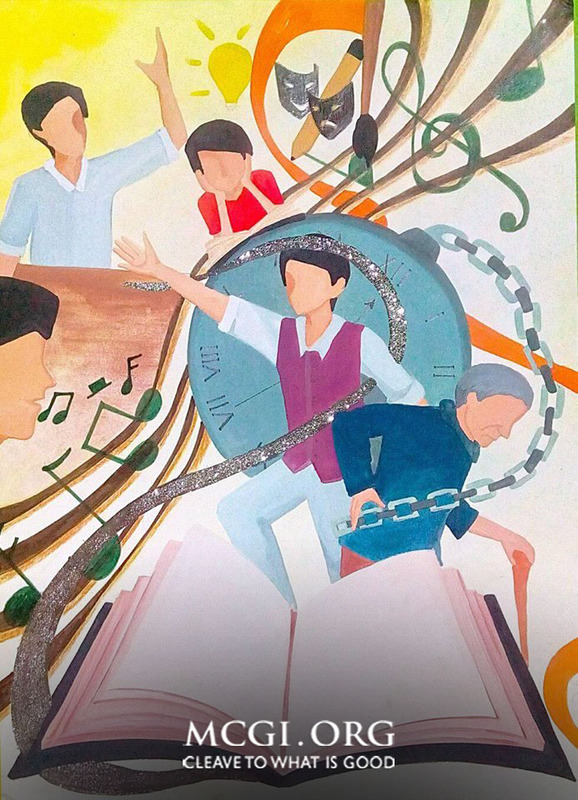 Members of the Teatro Kristiano from the Visayas and Mindanao, as well as abroad, may not be able to perform live on stage, but their pre-recorded videos were played on the big screen. Hence, the Best Dance-Play in Video category. In this category, it was the Mindanao Division who bagged the Best Dance-Play of the Year. The Teatro Kristiano of Japan took home the 1st runner-up while Palawan earned the 2nd runner-up. Under the Poster Making category, NCR’s “Paalala” or Reminder earned the most positive reactions or People’s Choice Award. The Best Poster Award went to the Quezon Marinduque for their dance-play “Oras Mo Kabataan” or “Your Time, Youth”. NCR’s poster entry “Paalala” or Reminder earns People’s Choice Award. 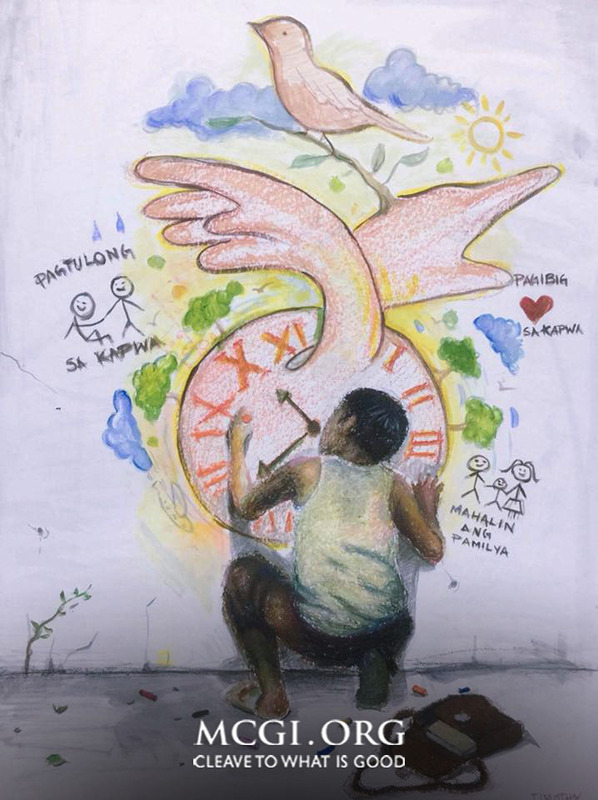 Quezon Marinduque’s poster entry “Oras Mo, Kabataan” or “Your Time, Youth” wins Best Poster Award. The evening’s panel of judges comprised of MCGI Representative Bro. Danny Navales, Sis. Ruth Soriano, and Bro. Arnold Sanchez. With God’s help, this year’s 9th Dance Play Festival proved to be a successful event and another artistic achievement for the MCGI’s Theatre and Dance Ministry. Sis. Leslie Longboen and Bro. Joshua Dionisio hosted the Dance Play Fest. The Members Church of God International’s (MCGI) Theater Ministry (or ‘Teatro Kristiano’ in the vernacular) are all set for the 9th Dance Play Festival on June 10, 2018 at the ADD Convention Center, Apalit, Pampanga. Set to begin at 5 p.m. (PHT), the Dance Play Festival is expected to showcase performances rich with spectacular choreography, role-playing and tableau. The theatrical presentation from the participating divisions are expected to feature narrative stories mixed with repertoire of movements. As mentioned in the audio-video presentation from the Theater Ministry, the participating divisions include Quezon-Marinduque, Central Apalit, Cavite, LBMR (Laguna, Batangas, Mindoro, and Romblon), Bicol, Bulacan, Rizal, Pampanga, National Capital Region, North 1, North 2, Palawan, Mindanao and Japan. As early as May, participating divisions were already preparing and readying to present an outstanding dance play. All striving to be unique and faithful to the theme, the participating divisions made sure that the productions were carefully crafted. “In our division, Bulacan, we brainstormed in order to come up with sets of concept and storyline. It was quite challenging period when it comes to merging different suggested ideas. Yet, we hope to perform our best, with God’s help and mercy,”said Sister Tracy Advincula, one of the performers from Bulacan Division, in an interview. Sister Tracy then added that the theme is timely for Christians, especially for the youths, that is, to always regard and reflect upon the righteousness of God. 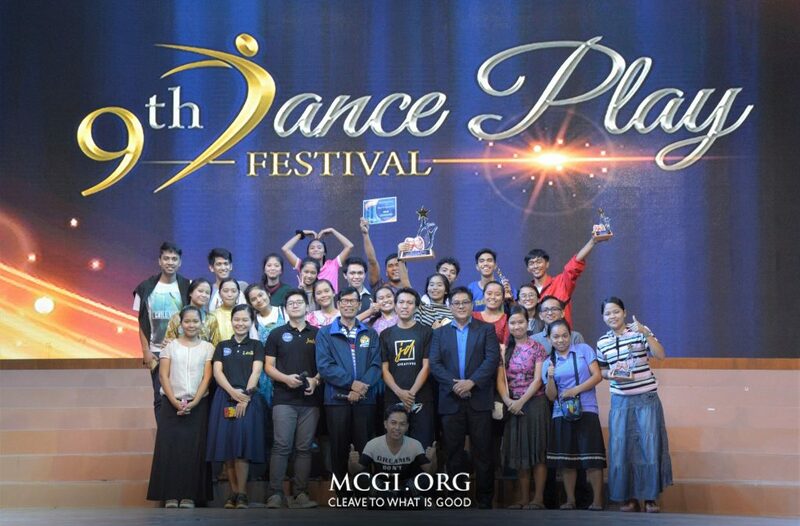 The Theater Ministry has been one of the bigger Youth groups in MCGI comprised of thousands of youths whose main line of duty is focused in the performing arts with the tagline, “To Entertain, Enlighten, Educate, and Evangelize for the Glory of our God”. Alongside with the Music Ministry, the members of Teatro Kristiano complements hymns and songs of praises in every Church events through their graceful movements and dance choreographies. “Most people use their talent only to please human eyes. As Christians who are taught with righteousness, we utilize the art of dancing to praise and worship God. He gave us talents, thus, we use it to glorify His Name,” said Brother Adrian Oquendo, the National Teatro Kristiano coordinator and one of the event organizers. Brother Adrian further invited MCGI brethren and guests to come and watch the upcoming festival. He noted that this event will also help boost and encourage the members of TK to pursue their duties in the Church, with God’s help. Admission is free and open to anyone who wants to attend the Dance Play. Members Church of God International (MCGI) partnered with UNTV News and Rescue to conduct a free medical mission for Persons Deprived of Liberties (PDL) in BJMP, Cainta, benefiting a total of 270 individuals. With the summer heat back in season for the country, illnesses and skin diseases are starting to rise, affecting many who are imprisoned in jails. Viewing this as a crucial health concern that must be addressed, MCGI and UNTV provided free health care services to BJMP detainees who are unable to access medical relief. During the medical mission, detainees were assisted with a number of services including free medical consultation, dental extraction, optical consultation, free medicine, and legal assistance with volunteer lawyers from UNTV. “The medical mission is very good because many received relief,” remarked Arlegui, explaining that the public service was greatly beneficial to the detainees who are lacking medical and legal assistance. “We are wholeheartedly giving thanks to Bro. Eli and Kuya Daniel. We hope there will be a next time for a second part of this mission for this year,” Rhea Arlegui thanked the group for their public service. 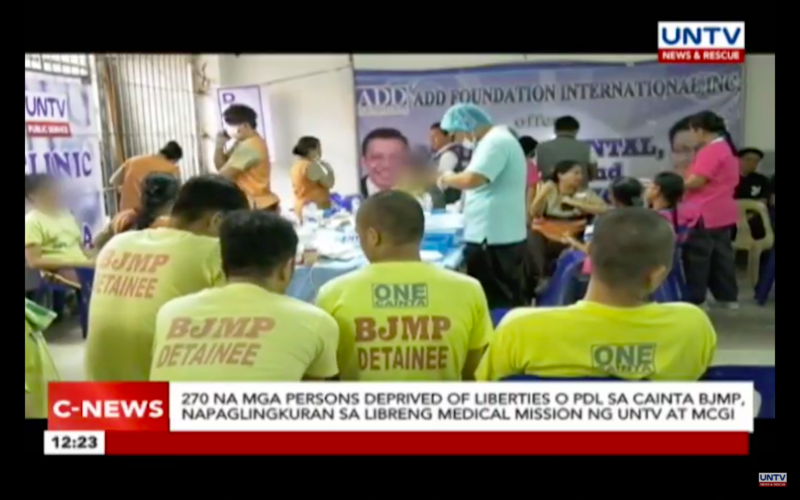 The medical mission marked the group’s second public service for those imprisoned in jail, making it a goal to reach out to those who lack liberties for public services.